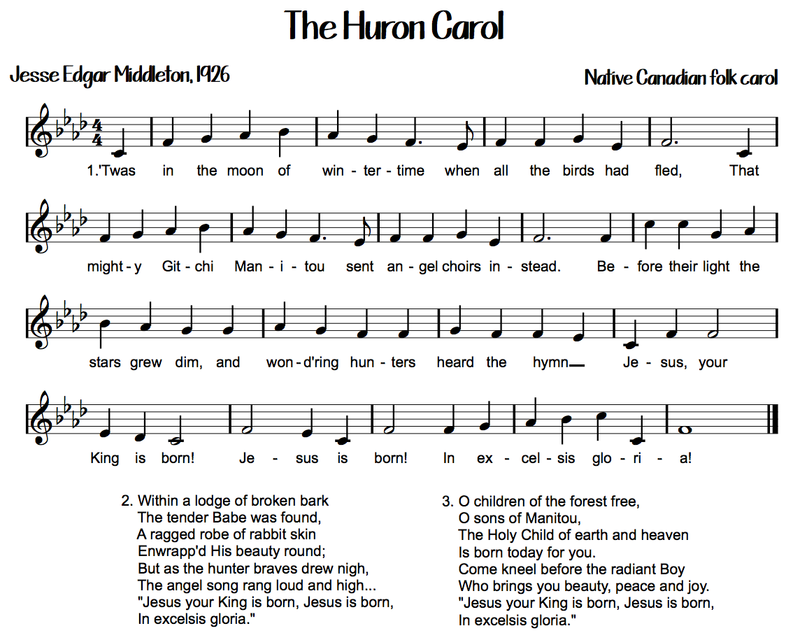 The history of the Huron Carol is a Canadian story that has journeyed over four centuries an,d three cultures, from oral tradition to a place in the hymnals and songbooks of congregatiuonbs and schools across this country. In the early seventeenth century, founder Samuel de Champlain envisioned a new people born uniquely of this continent through the intermarrying and sharing of common spiritual and cultural values. It was a long way from the forced conversion and institutional racism introduced and practiced in the eighteenth and nineteenth centuries. Fr. Jean de Brébeuf, Jesuit missionary to the Huron, penned the original words in Wendat/Huron in 1643 and set them to a popular French song called La Jeune Pucelle. It tapped into Huron traditional values while teaching the Christian story. In spite of Brébeuf's martyrdom and the final scattering of the Huron people during the Iroquois uprising in 1649, the song lived on in oral tradition until its transcription into Wendat. It came alongside a French translation by Paul Picard, a Franco-Huron notary who worked with Fr. Etienne de Villeneuve, S.J. He was the last Jesuit to serve the Huron, and he left behind many manuscripts and transcriptions of their hymns and chants, including the Huron Christmas Carol. The song prevailed in post-conquest Québec, and it was known orally for another one hundred years until it was published in the Noëls Anciens de La Nouvelle France by Ernest Myrand in 1899. In that same year, while working in Québec City, historian, journalist, and choir director Jesse Edgar Middleton discovered the publication and took it home to Toronto. In 1926 he published a free translation of the song from French into English, called "Twas In The Moon of Wintertime, and asked his fellow choir director, Healey Willan, to provide an arrangement from the folk song for the pageant Brébeuf. The version in our hymnal is a later Lutheran arrangement. 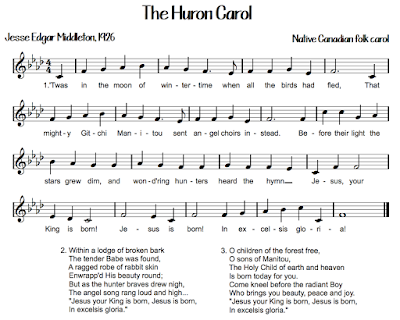 I was very young the first time I remember hearing and singing the Huron Carol at a Christmas Eve service and it was a transcendent moment. The setting of the Nativity scene was familiar and relevant: cold and sparkling in the moonlight and warmed by furs, this child belonged to me. Last year I received a family book about my maternal grandmother's ancestry going back over 400 years. Among my many grandparents, a few stand out -- including the Algonquin warrior and clan chief, Charles Secham Packarini, who was nursed by Jeanne Mance in her Hôtel Dieu in the new town of Montréal in 1643. She also sponsored the young warrior at his baptism that year, and he went on to witness the many baptisms and marriages of his clan family, including the marriage of his granddaughter Marie Mitouamegoukoue to Frenchman Pierre Couc dit La Fleur in 1657. Two hundred years later their descendant, and my grandmother's father, was born in La Prairie, Québec. Narcisse Cayer left Québec for Manitoba in 1880 and started a new family chapter. In 1910 he led his growing family and a small band of Franco-Manitoban and Métis families north to the western shore of Lake Manitoba, where a ranching community exists to this day. What remains of my great-grandfather is a headstone in the graveyard of the little Roman Catholic church he built in 1933. The church stands on the prairie landscape, decommissioned and with a crypt still full of water from last year's flood. Its name is St. Jean de Brébeuf. Mutual respect for the spiritual and cultural traditions of the three founding peoples of our nation lives in my own family and in this hymn, the Canadian Christmas carol.